Copyright 2014 SVJ Designs, LLC. All Rights Reserved. Opened December 3, 1915 and had 1,200 seats. Operated by Landmark Theatres since 1989. It was twinned in 1990. 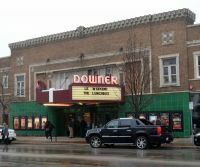 This movie theater is near Shorewood, Glendale, Whitefish Bay, Milwaukee, Wauwatosa, Brown Deer, River Hills, West Milwaukee, W Milwaukee, Bay View, Fox Point.